Brock Morman engineered the audio recording. 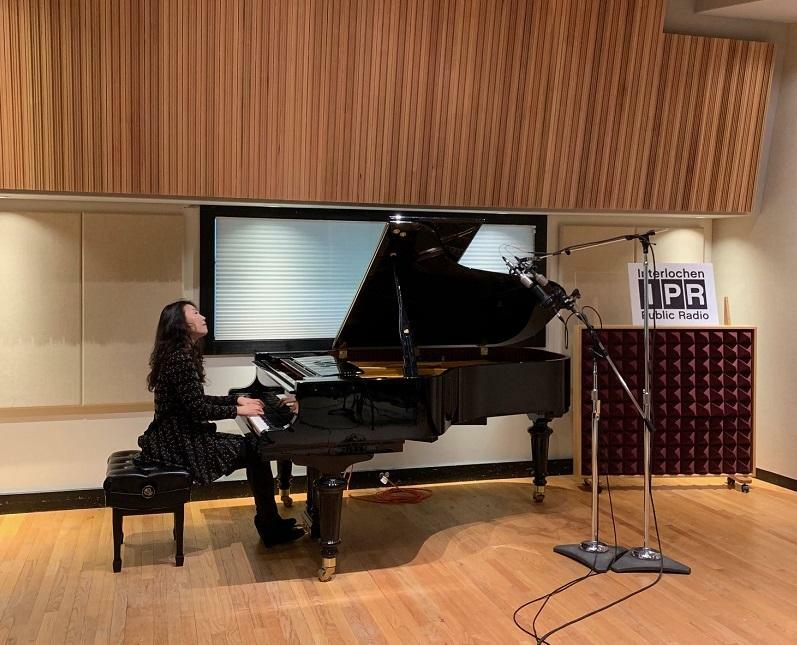 Jeeyoon Kim will perform at the Ramsdell Regional Center for the Arts in Manistee on Saturday February 23, 2019 at 5 p.m. Click here for more information and tickets. The concert will include artwork by Moonsub Shin. 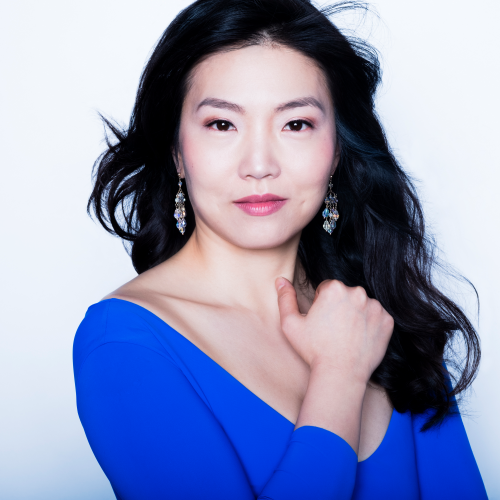 Jeeyoon Kim's recital is presented in partnership with the Shoreline Music Society. It's my musical vision of flight. I invite all the listeners to take a flight together - I'm flying, and let’s soar together over, above, beyond. I selected pieces that reflect the vision of flight and lightness and hope. When you come to a concert, there [isn’t] any written program for the pieces I will be playing. I will be onstage with a microphone, and before I play each piece, I explain what the piece means to me what I want them to listen for. Like in a sushi restaurant, it’s an omakase program – chef’s choice. I want them to dive into an experience of music without really having a set agenda. Although I do carefully prepare this musical meal for them! I give out the program at the end of the concert, but I don’t go out backstage – I stay on the stage talking [with the audience members]. Moonsub Shin created 13 different illustrations for each variation. I flew to New York and played [the piece] for him. We had many, many conversations about this particular piece and what it means to me musically. From there, Moonsub took [his] visual interpretations of my musical interpretation of this piece. While I play this particular piece, there [is a] projector above me, and each [work of] art will be projected while I play that particular variation. I spent a lot of time planning how to convey this piece to the audience, and having the visual elements actually makes them linger a little bit longer. People find it easier to digest at first hearing. It’s one of the Forgotten Melodies, and [Medtner] is also sometimes forgotten. [laughs] He's a wonderful, wonderful Russian composer that has a very rich harmonic language and a variety of piano literature. He’s not well known to many people. This piece reflects my Over. Above. Beyond. album [because] I imagine I’m flying just like an eagle over a horizon, and by the time the piece ends, I arrive the top of the ridge. We are the YouTubers. We get to experience a concert or someone else's performances - not live, not [on an] album – but [by watching it on] YouTube. When you watch this music video, I wanted to create the very mood that I am in when I play [the Medtner.] You feel that peacefulness in the gentle glide of the pond, and that is exactly the music reflects. I wanted to convey the message of this music visually as well. There’s an illusion that I am flying [in the video]. I'm wearing that kind of flowy dress in the canoe. At the beginning, actually, the director pushed me into the middle of the lake, and then after that I had to paddle. [laughs] After shooting that scene, I had blisters because I was holding on so hard and was afraid I was going to fall out [in the lake] in this gown. It should look very peaceful, but I'm a little nervous that I’m not going to get back to the shore! This is one of the most loved piece for my live concerts, but it’s not on the album. I’m planning to go back to New York to record this particular piece in May. It can be a bonus track for my Over. Above. Beyond. album. It reminds me of meditation. Nowadays I try to meditate as often as possible, but I'm always amazed how many different thoughts come in and out in my head. This piece has a lot of different ideas [going] in and out, but, just like magic, at some point in the piece, I was finally able to focus on breathing only, and there's a void of thoughts in my head – for a very short time. But this piece reflects that meditation for me - or prayer. When I finish a concert program, people ask for an encore, and that's the concept behind [the album]. But at the same time, when you are with someone or have a great experience of any kind, then you wish you could have ten more minutes of that. I find that is a very humble wish. It's not like ten more years, or ten more hours, but just ten more minutes. I wanted that humble longing in my album, so I selected pieces that represent that longing. People my age love pop music, jazz and theater, but they don't come to the [classical] concerts. They just don't [know] the right way to experience it. Older generations grew up with experiencing classical music in the right way, which is going to live concerts - there's no iPhones, there's no [distractions]. But I find that many people don't get to have that [kind of] chance to listen to [classical music], like where someone in the living room or that kind of intimate setting and talking to you about it. So I’m trying to reach out to the audience in that in a more personal way, because then people find classical music altogether [more easily digested] and really get it. Once they get it, they’ll venture out to another concert or another album. But I want to be that bridge person, that missionary to bring people to the other side of the river. This is a very happy ending note. Where this [radio] studio is located, it’s rustic and in Michigan, and it’s a snowy day and beautiful. I was actually smiling thinking about this piece in this setting because this piece reminds me of a very rustic scene, as if I am a little rabbit and attending my squirrel friend’s wedding. Everything makes you smile and happy. For me, this [piece] is not the actual wedding but on the way to get to it, so it's the anticipation of a great event. You're smiling with friends and walking in the woods. I am smiling when I play this piece - I hope you do too.